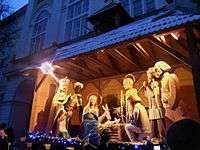 The Ukrainian Christmas festive days according to the Julian calendar, start on 6 January, Christmas Eve, and end on 19 January, "Jordan" or Epiphany. The image of Svyatyi Mykolai as a person who brings the Christmas gifts for children, the feast of which is marked on 19 December. It is supposed, that children should find their Christmas gifts under their pillow on that morning. Sviata Vecherya or "Holy Supper" is the central tradition of the Christmas Eve celebrations in Ukrainian homes. The dinner table sometimes has a few wisps of hay on the embroidered table cloth as a reminder of the manger in Bethlehem. Kutia (sweet grain pudding) is traditionally served at the Ukrainian Christmas dinner table. It is often the first dish in the traditional twelve-dish Christmas Eve supper (also known as Svyaty Vechir) and is rarely served at other times of the year. 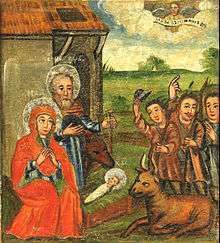 When the children see the first star in the eastern evening sky, symbolizing the trek of the Three Wise Men, the Sviata Vecherya may begin. 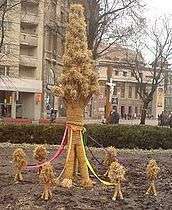 In farming communities the head of the household now brings in a sheaf of wheat called the didukh which represents the importance of the ancient and rich wheat crops of Ukraine, the staff of life through the centuries. Didukh means literally "grandfather spirit" so it symbolizes the family's ancestors. In city homes a few stalks of golden wheat in a vase are often used to decorate the table. Shopka is a traditional portable nativity scene used to represent nativity and other figures in a puppet form. ↑ "Boh predvičnyj". Metropolitan Cantor Institute. Byzantine Catholic. Retrieved 12 August 2015.